Woke up early for a trip to NOLA. Girl Power 2012. An all-women Super Sprint Triathlon. 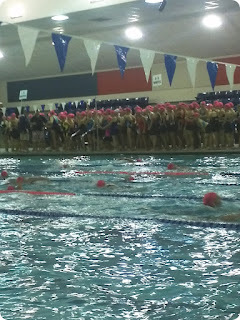 Several of the local girls went as their first or almost-first triathlon: Allison, Beth. Cheri, Nancy, Peggy, Randi, and Shannon. 650 registered competitors. Indoor swim: 300 meters (6 laps). 10 mile bike turned into 8 miles due to standing water on the course. And a 2 mile run. Never just WATCHED an event before. Was interesting to see people going through the motions, rather than being a part of the chaos. Enlightened by observing everyone swim. Remembering my first race (Traditions in 2011) and how my face never entered the water. So ineffective and slow. How I gassed out mid-way and attempted to backstroke for a while. Reinforced the critical importance of good form. Minimizing drag. Minimizing effort. Conserving energy. None of which entered my mind last year, but haunts my thoughts these days. Overall, great event. Some complaints about the course, mainly due to weather. I think all the girls broke personal records. And many of them ranked well in their groups. Proud of all of them and happy to support their efforts. The first for most of them, but hopefully not their last. Still making constant improvements on running. My main focus, actually. Because my complete suckification at running. It's always been an albatross around my neck. So I'm aggressively sticking to the plan. Luke suggested a couple of changes which have seriously helped me and done wonders for my confidence. He says no matter what pace I run, or the length of the run, do intervals: 5min run, 1min walk. And take water with me. Those changes have made all the difference! Mentally I can tell myself, "You're only running for five minutes!" And then I get a break. Swish some of the water in my mouth. Take a sip. Control my breathing. Then tell myself I'm doing great and have plenty of energy left. Been running at night. Nearly naked. Just the running shorts and my shoes. A pale, sweaty werewolf jogging through the neighborhood in the dark hours, trying not to scare small children. Much cooler that way. And I don't care who sees me. Though I'm rarely seen. Sometimes only one or two cars pass me the whole time. But it is an interesting change, for me. Proud of myself, but I'm probably a horror to behold. This week's long run was supposed to be an hour and forty five minutes. I was doing PRETTY well. Lots of energy, not much woe, very little talk from the lizard trying to derail me. But an hour into it I started getting hungry. And then a half hour later, it started raining. Didn't want to risk getting my phone wet, so I headed back to the house. Ended up doing 90 minutes and 9 miles. Another PR! Program is working. Gaining new confidence each day. If I can do 9 miles, I can do 13! Just pace myself. Fuel myself. And keep focused. Couple of week, I'll make it through my first half Ironman. Beware, the Thundergod! Luke finalized my training schedule. Starts off tough. Ends tough. I've been running 10K (6 miles) without dying. Usually takes over an hour. But this new schedule started off with a bang: my long run last night was 90 minutes. And I went over eight miles. A new Personal Record (PR) for a solo run! Didn't die. Didn't collapse. And the next day, I was sore, but not crippled. Last I attempted such a distance by myself, I only went 4 miles and destroyed my shins. I didn't run again for over a month. Swimming has been good. I've already trained enough so that a mile is no problem and 1.2 is doable during an event. Thankfully, two years into it, I have muscle memory and don't really "think" about swimming any more. It just sorta happens. Biking isn't bad. On a bad day, I'm above 18MPH. On a good day, a little over 19MPH. I've done two hours before without any problems. I'm usually doing at least one these days. But won't be long before I'm doing two hours at a time, maybe even three. Happy with the results so far. I think it is trimming off some of my babyfat, too! I feel thinner. I think I look thinner in the midsection. Not going to hop on a scale and ruin it, though! Maybe I'll weigh in before the event. But not any time soon. It's just a number, anyway. On the heels of my first Olympic distance triathlon, I've been giving serious thought to: what is next? I've done Sprints. I've done 5K runs. I've done metric century rides. And I finished Rocketman without puking, crying, drowning, or otherwise dying. Thus I find myself asking: what is next? One logical, but challenging answer is a 70.3. Often called, "a half." Or, better yet, "a half Ironman." Usually somewhere along the lines of: a 1.2 mile swim, 56 mile bike, and 13.1 mile run. Somewhere around seven hours of effort (at my pace) at a cost of between seven thousand and ten thousand calories. A half Ironman is like nothing I've ever attempted or done before. In fact, I've tried (and failed!) to train for a half marathon (the 13.1 mile run portion of the show!) and ended up injuring myself pretty badly. But I've had a really good season this year, learned from my previous mistakes, I'm much better with my training and nutrition. So I think I can do it, but where? Turns out that in early November there is a new 70.3 a couple of hours east of here, in New Roads, LA: the River Roux Triathlon. It's the right distances and far enough in the future that I can focus on training my individual weaknesses between now and then. So I talked to Luke. He is putting a plan together for me. 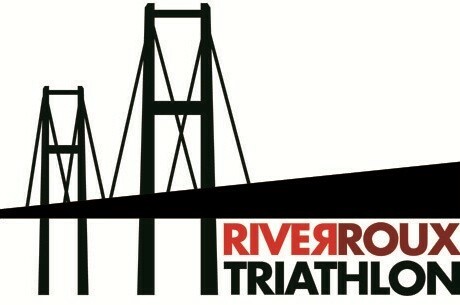 I will train for the next 8 weeks, focusing on my run, then attempt my first 70.3 on November 10th. In the meanwhile, I've been sticking to my previous training schedule and looking forward to kicking it up a notch. For 9/11, I did something new. Give my first kick. On Kickstarter. 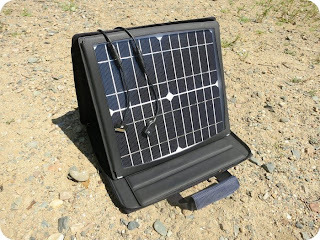 To SunVolt: a portable solar power station. Nice little panel. Could charge multiple items. Can use it when I'm training, or on a long trip. Plus it helps out an inventor who never would have been able to bring an item to market on his own. Long day. Need the karma. Skipped swimming due to a financial fight. Had a lovely disagreement whilst working. And projects kept me late, missing my ride. Good thoughts. Good thoughts. Good thoughts.And microfunding for SunVolt! Gotta be some silver lining to these dark clouds. Somewhere. I've been a huge fan of my Leatherman Skeletool. We've been inseparable. Four years and counting. Served me well the whole time. But I have a confession. I've been cheating. I picked up a new tool. A cute little piece of kit from Gerber. Their Crucial F.A.S.T. multitool. And, man oh man, is she a keeper! The good stuff: smaller, lighter, very easy to open one handed (thanks to the Forward Action Spring Technology powering the blade) and quite nice on the eyes. The bad stuff: I'm not in love with the actual blade. Sure, it pops out like lightning, but it isn't the most fierce-some thing and doesn't have much heft to it. As a minimalist, I like the bounty of functionality in a small form factor. And I like the aesthetics. Quick, clean, and sleek. But as a testosterone drenched knuckle dragger, I need something potent and aggressive. Not sure if Crucial F.A.S.T. will be able to keep up with me in the long term, but I'm going to put her through her paces. If the relationship doesn't work, I can always go back to the Ol' Faithful Skeletool.